Sidney Crosby's postseason, or lack there of, has been been well-documented. After achieving so much so quickly and setting the bar so high, he has set lofty standards for himself to live up to. When your team had their division wrapped up for nearly two months and you win the Art Ross trophy by a double-digit point total, maybe it is easy to put things in overdrive... or maybe he was injured. Whatever the case may be, Captain Crosby righted the ship in Game 2 against the Rangers. You see, I feel the need to emphasize Captain throughout this article because Crosby has been facing questions, not only this postseason, but in the weeks and months leading up to these playoffs. Is Sidney Crosby really the right man to lead this Penguins team? Those questions got increasingly louder when Sid only scored one goal in the last ten regular season games. Then they were almost ear-deafening in the first seven games of these playoffs. It culminated with a 3-2 OT loss to the Rangers on Friday night with a -3 for Crosby that led many Pens fans to decide it was time to trade the league's MVP because he was just not the same player and was not bringing anything to the table this postseason (this really is a non-fiction piece, believe it or not). As a leader, I will be the first one to admit that I thought Crosby may need to be a bit more vocal. After a rough patch earlier this season in late March, Brooks Orpik and Rob Scuderi hosted a players only meeting -- much to the delight of Pens fans everywhere -- to light a fire under the team. I mentioned back then a meeting like this may mean more to the team if it came from the Captain, if it came from Sidney Crosby himself. We all know that this is not the way Sid leads, but I thought it should be something he adds to his repertoire in time, and maybe he still will. But last night's performance was the best way to shut up any critic, including myself. If there is any question what Sid means to this Penguins team, it was answered over and over throughout the game last night. It seemed like almost to a man Crosby's game last night resonated through all four lines, through the coaching staff, and through Consol Energy Center. Almost fittingly he was not available to speak to the media last night -- can you have a mic drop without saying anything? -- but what did he need to say? He left it all out on the ice with his play and the entire team followed suit. That is leadership. That is what Sidney Crosby means to this team. All of a sudden this team looks incredibly dangerous. Sure it was one game, but could this team be clicking at the right time? Are they starting to find their identity led by Crosby and Malkin? Remember that Malkin sacrificed his body on more than one occasion in the first round against Columbus to block shots. Crosby seemingly won every one-on-one battle last night. He got to the dirty areas. He fought for the puck. He was the Sidney Crosby we were used to seeing. When your star players have other worldly talent like Crosby and Malkin but still play like a mucker or grinder, that is the perfect combination. It is no coincidence that Sid set the tone last night and the Penguins played their best, most complete game in three to four years. The true test for this team will be the game tonight. Was Sunday just a blip on the radar? 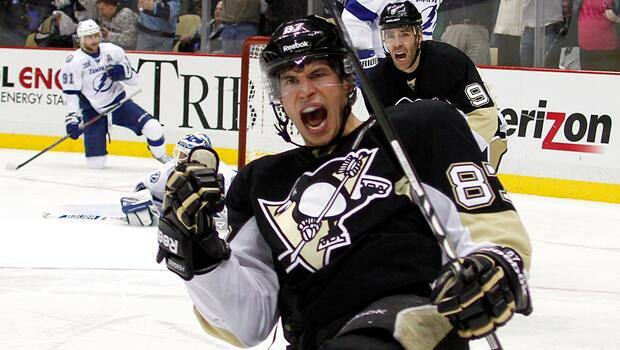 Will Sid be himself again tonight? Can the Penguins put together two complete games in back-to-back nights? If we see much of the same tonight, look out Eastern Conference and NHL in general. This team is healthy at the right time, and all of a sudden looks like a dangerous playoff team. The top two lines have been great all season, but the third line of Sutter-Goc-Bennett is a puck possession nightmare for the opponent and a scoring threat in its own right. The fourth line of Vitale-Adams-Gibbons can control play with their speed (at least Vitale and Gibbons) and are not a liability to put on the ice. The penalty kill has been perfect this series. The power play got on the board last night. Marc-Andre Fleury seems to be looking more like the Fleury of 2009 than the Fleury of 2013. We will find out a lot tonight, but if this team makes a deep playoff run this season, look back to the game Sunday night and look back at the Captain, Sidney Crosby.